The Arroyo Grande Library is one of the busiest branches in the San Luis County Library System. Conveniently located near Highway 101 near Halcyon exit, the library is an active and thriving part of the Arroyo Grande Community and South County. The library offers an ever-changing number of events and programs to meet the needs of all ages. To see our current adult and children’s programs see the next two pages. The Library has also fully entered the digital age. 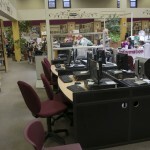 It offers free Wi-Fi (either bring your own laptop or tablet or use one of our eight public computers). The library also now offers Chrome laptops and “hot spots” for checkout. Library cardholders can also access SLO MakerSpace for up to 15 hours/week. This site is for inventors, experimenters, builders, hackers, explorers, crafters and lifelong learners. Also use your card to download eBooks and audiobooks using the Overdrive App. You can also borrow or simply browse the Library’s collection of your favorite digital magazines using Zinio. The newest feature is the hoopla app, which allows your to instantly stream movies, music, TV shows or download audiobooks, comics and eBooks. Check out these and other features at http://www.slolibrary.org.